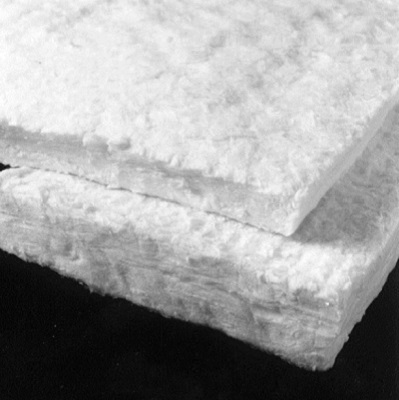 RSBL Alumina Silica Blanket | ZIRCAR Refractory Composites, Inc.
ZRCI Alumina-Silica Blanket Types RSBL-2300 and RSBL-2600 are mechanically-needled ceramic-fiber blankets that provide effective solutions to a variety of thermal management problems. RSBL-2300 and RSBL-2600 blankets exhibits good strength and handleability. They are low density with good chemical stability. RSBL-2300 and RSBL-2600 provide low thermal conductivity in numerous high-temperature laboratory and aggressive industrial environments. They have low shot content and are easily cut with scissors or knife. They are available in a wide range of density and thickness combinations. RSBL-2300 is made from spun Al2O3 -SiO2 refractory ceramic fibers (RCF) and is capable of long service life in applications with temperatures to 1260⁰C (2300⁰F). RSBL-2600 is made from spun Al2O3 -SiO2 -ZrO2 refractory ceramic fibers (RCF) and exhibits extended service life in applications with temperatures to 1427⁰C (2600⁰F). Types RSBL-2300 & RSBL-2600 Alumina Silica Blankets are ideal for use as furnace insulation in sintering, heat treating and chemical thermal process systems. High temperature furnace and kiln linings. High temperature gaskets and seals. Backup thermal insulation in furnaces, solid oxide fuel cells and thermal process systems operating to high temperatures. ^ Properties expressed perpendicular to thickness.